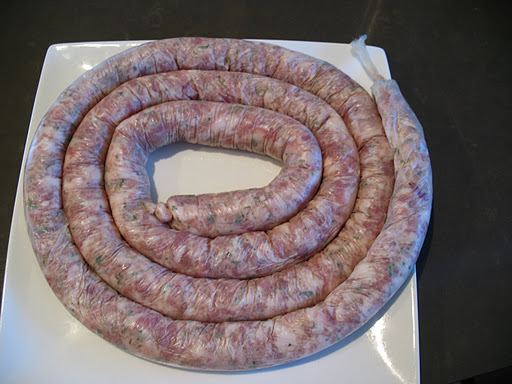 Last year something inspired me to make my own sausages. Subliminally I might have been influenced by the NIB summer commercial “I love sausages” however I’m sure it was just part of my learn to cook and be self-sufficient craze. 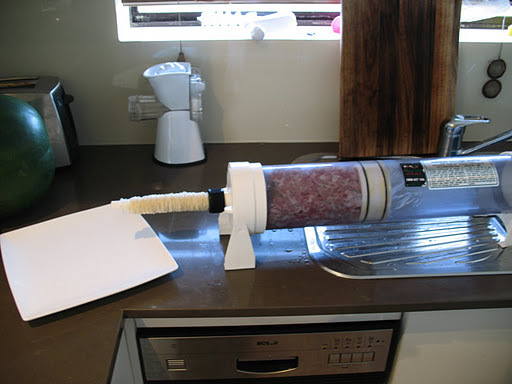 In any case, and despite many raised eyebrows from friends and family, I eventually bought the “Dakotah Sausage Stuffer“, a 4kg water-powered meat pushing beast of a unit (and a massive space filler in the kitchen cupboards). It took me a few attempts to get the technique sorted and buying the right parts (hoses, nozzle attachments etc). The most recent acquisition to make my sausage making experience easier was a mincer. 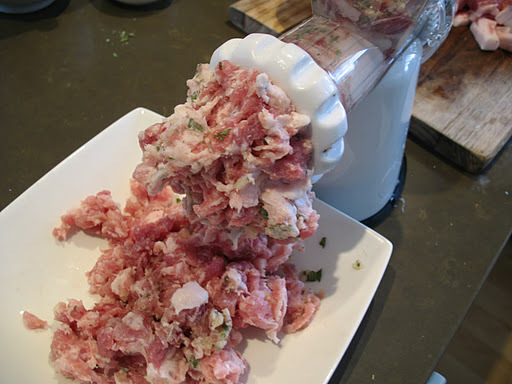 Up until now I’ve used a food processor that just didn’t chop the meat fine enough, ending up with largish chunks of fat in the sausages, not a key feature found in the worlds best sausages, so the mincer was on the Christmas list. I scored a Chef Avenue Wonder Mincer ($49 from King of Knives). I decided to go with a simple recipe to start with, the old favourite Pork and Sage, and because there’s nothing garlic doesn’t go with I added garlic. On the left you can see that there’s also some beef and beef fat. A lesson learnt (and researched) is you need to have about 30% fat. That seems a lot but being dry doesn’t make the top 10 best sausage feature list! I didn’t end up using the beef fat as the pork fat was enough. 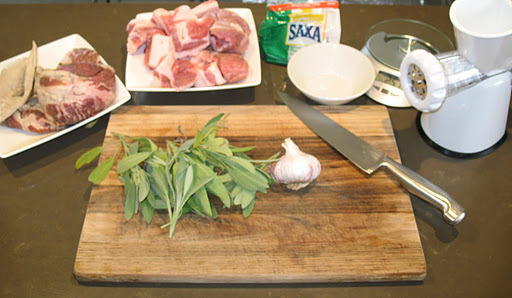 Once I had all the ingredients ready I chopped up 10g of sage, crushed up 25g of rock salt, 3 cloves of garlic and trimmed the fat off the 1.3kg of pork so I could measure the fat ratio (ended up with approx 400g of fat which is 31% of total meat). Next step was to mince the meat in my brand new mincer. There was a little apprehension that the cogs were plastic and I really had no idea how hard it was going to be. Surprisingly it was very very easy. The cogs work so there’s really very little pressure required. The trick however was to ensure the bits of meat were small enough to fall into the spiral pusher-thingamajigit, too big and they got caught and needed to break before continuing towards the blades. I added the salt / sage / garlic mixture to the mincer but in hindsight I’ll just mix it in by hand because I lost too much inside the mixer. All up it took me about 2 hours to prepare, mince, make and cook the bangers however you definetly get economies of scale the mince you create. Total cost $18 keeping in mind that I know exactly what’s in these snags. 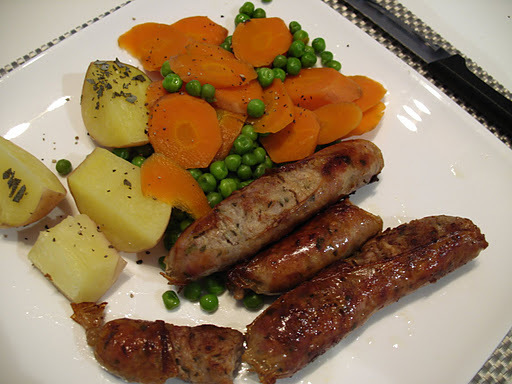 I could buffer it out somewhat by adding bread or other fillers but for the time being I’m happy with pure meat snags! What did they taste like? Best I’ve done so far I’d say. Perhaps a little salty and a lot of fat rendered in the fry-pan so I could probably cut back on both those. Experimenting and learning is most of the fun! What do you think? 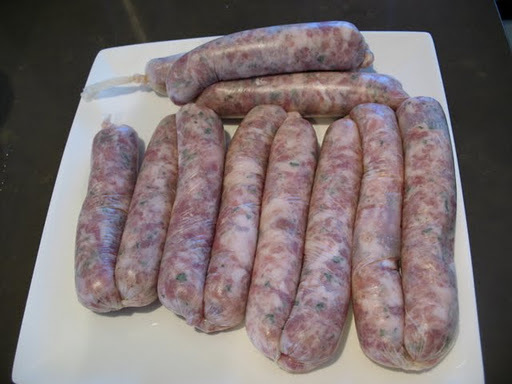 Would you spend the time with home-made sausages or do you trust your local butcher to use quality ingredients.